The 24-70 2.8 IS pretty much seals the deal for me on the EOS R. Been a hold out on the 24-70 zoom lens because of lack of IS (my current trio is 16-35, 50 and 70-200). I might buy the EOS R after first price drop and the 35 1.8 then wait for the 24-70 2.8 to drop. The EOS R will primarily be a Gimbal cam and as my second stills camera. If i need 4k/60 or 1080/120, I have my 1dx2 to fill that slot. But I like the thought of an EF 24-70 2.8 IS even better. Yes , there is certainly a good reason, namely the enormous optical complexity of such a lens, unless you'd accept a loss of quality. The 28-70 seems to have attained a new summit in terms of sharpness and contrast (assumption based on the Canon MTF data), so it would be a pity to sacrify this for a wider zoom range. They won't be producing EF versions - look at the designs. They are short back focus with large rear elements. See the Canon EOS-R white paper for a lot more about why this aspect of the RF mount is an important feature. Remember that this is a patent application to show aspects of optical design - not a lens roadmap! yes, well chosen lens parameters allow for a larger optical design space. see also Thom Hogan's article. 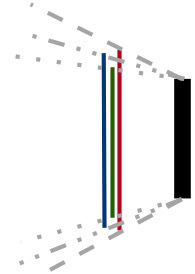 Inner angle is Sony FE, outer is Nikon Z, middle is Canon R (close to scale). In theory, Nikon has the most design flexibility, Sony the least. The new RF mount has a flange distance of 20mm with a throat of 54mm. Nikon's Z mount is the "big boy" now, flipping the advantage of the EF over the F mount that reigned through the film SLR and DSLR era. Whether that shows up in any real advantages to users remains to be seen, but Nikon does have more optical design space available to them than Canon and Sony. Doubt it. Since the EF 24-70 2.8 IS seems like an obvious thing to do, and it hasn't materialized, yet it's apparently now in the works for RF - I would draw the conclusion that we'll be seeing all the forward-thinking development going into RF and not EF from here on out. My guess is that they will go the Panasonic route compared to Olympus - Canon will concentrate on getting a camera will all the real goodies such as effective AF tracking and frame rates and will rely on in-lens IS. When they have finally got a workable IBIS they will incorporate it with a dual IS between body and lens giving an even better IS. I am not aware so far that the top range Sony lenses without IS are noticably smaller than the Canon L lenses with IS. I was expecting the EF 28-300L to get replaced with a EF 24-300L with the turn to zoom instead of the old pull-push design but at this point I do not believe Canon will release the EF 24-300L instead might release the RF 24-300L. If at all Canon releases the EF 24-300L that might be a sign Canon might not introduce more FF MILC any time soon and we may see more FF DSLRs. In any case I guess we will see next version of 7D2, 1Dx2 and 5D4 in the DSLR form. I hope Canon releases the next version of 5DsR in the MILC form without AA filter. Other than that I guess we can expect Canon to release the f/2.8 RF trinity sooner than later. Pity the prospective RF 24-70 and other future RFs have IS. That indicates Canon isn't planning to add IBIS even to higher-end bodies in the future. Interesting why Canon chose a 20mm flange focal distance for the RF mount. I originally thought it was so they could make an RF to EF-M adapter, but Canon News’ article suggests that’s not possible. Is there a good optical reason why they didn’t go for 18mm BFD (like EF-M), or shorter (like Nikon Z), or is it a cynical ploy to make adapting other mirrorless mount lenses impossible and complicate the efforts of third party manufacturers to make RF mount versions of their FE mount lens designs? Besides two or three other big white telephoto lenses, EF mount is finished in terms of new lens releases. However, don’t let that fool you. Your bag full of EF glass is great and will continue to work great on the EOS R body family! Doubling the number of lens-mount interfaces - I’ll leave the explanation to Roger Cicala: https://www.lensrentals.com/blog/2013/09/there-is-no-free-lunch-episode-763-lens-adapters/ No, the sky won’t fall in because of this. In the real world and with a 30MP sensor, I doubt you’d notice unless you get an unlucky combination of lens, adapter & body that are all enough out of tolerance in the same direction. On the other hand, for those advocating a future EOS R series body with a high resolution sensor, perhaps it is a worry. “MELVILLE, N.Y., April 1st, 2019: Canon U.S.A. Inc., a leader in digital imaging solutions, today announced the new EOS RS featuring Superduper autofocus*, 80MP orgasmic sensor and... [*feature only available with Canon RF series lenses]” - I think we can all see this coming! It’s pretty reasonable to assume there’s a reason for the new 12 pin connection on RF lenses. Whilst I’d be happy to adapt my existing lenses, I wouldn’t want to buy a new EF mount lens with the intention of adapting it to RF mount. 80MP orgasmic sensor and... [*feature only available with Canon RF series lenses]” - I think we can all see this coming! Does that make the camera more fun to use?